Today, we will continue the chapter dedicated to drums recording considering other close miked elements that aren't necessarily indispensable... It depends on the situation, as you will see. We'll begin with the hi-hat. 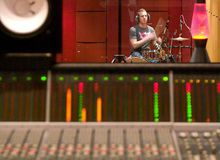 Generally speaking, the overhead stereo tracks ought to be more than enough to faithfully reproduce the hi-hats. However, in some occasions your overheads will need a little help. For instance, if the groove of the hi-hat is particularly predominant or the subtlety of the playing or speed of the pattern require an extreme precision, chances are these small but important details will get overshadowed by the rest of the sounds captured by the overheads. The famous hi-hat groove on Isaac Hayes' Shaft would have never had the same emotional impact had it been recorded with just the overheads, don't you think? Another case where it would make sense to close mike the hi-hats is when the snare is pinned down to the center of the overhead tracks. In that case, the hi-hat will probably be completely out of place, towards the center of the stereo image, when you add the Snare Top track. The latter will certainly need to be placed firmly at the center for it to be coherent with the overheads, but the bleed of the hi-hat in the Snare Top mic will tend to pull them towards the center with the snare, which will only blur their localization in the sound field. And that's when a closed mike track of the hi-hat will allow you to set things straight, giving you the possibility to place more precisely the attack of this element where you want it. And if you want a less aggressive high end, without it losing its natural quality, don't hesitate giving a ribbon microphone a try. When it comes to placing it, there are no mysteries. 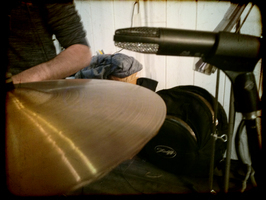 Simply place the mic above the hi-hat so that the capsule points somewhere between the rim and the bell. But make sure that it doesn't interfere with the opening of the hi-hat — 2.5 to 4 inches away is usually a safe distance. 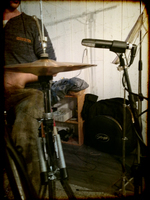 As you can hear, the amount of bleed of the other elements of the kit varies depending on the density and intensity of the drummer's playing. But that won't necessarily be an unsurmountable problem during mixdown, since what you are after here is the attack of the hi-hat. There are different means to isolate a bit more the attack during tracking or mixing — EQ, gate, editing, etc. — it's up to you to decide what works best. And if the bleed really annoys you, there's a simple trick to minimize it during tracking without the need of any additional processing: use a figure-8 mic! As you surely know, this type of mics have the particularity of rejecting sound 90º off-axis. So if you place it in a way that most of the elements of the kit are 90ª off-axis, you will get a "cleaner" hi-hat take. But do note that, given the bidirectional nature of the mic, this will also entail capturing more room than before — you don't get something for nothing. See you next time to discuss the toms.